Polish your casements with a new cleaning method that has met the needs of over 94% of our clients in Mayfair! A: Unlike the classic ladder & sponge method, the water-fed pole allows the cleaning team to reach windows from the safety of the ground. The telescopic rod is 22 metres high and can easily reach even stains on the fourth storey of your building. Q: What other washing possibilities are included in window cleaning Mayfair? A: Besides providing diligent exterior window cleaning, the licensed technicians can also ascend and clean any commercial skyscraper – a service called rope access window cleaning. Finally, the cleaning experts can also take care of dust found on the interior side of your panes, and will employ ladders and sponges to access distant corners. A: Our water has been filtered from all naturally found hard minerals. As a result, it will efficiently eliminate all splodges on its path and will evaporate under the sun without leaving sediments of its own. Q: Does your service cover treatment of industrial properties? A: Yes, the Mayfair window cleaners will arrive with the latest cleaning gear to clean commercial buildings both small and lofty. The pros can also carry out additional cleaning tasks, for instance patio washing and gutter cleaning. A: Certainly. The team's water-fed pole is attached to a special distilled water storage inside the cleaning vehicle. In case the fluid has been used up, the specialists will kindly ask you to provide them with any internal or external water source. A: Yes, all our services are comprehensively insured for your peace of mind. However, our washing approach is among the safest that you can find on the market and we'll make sure to wash your casements without leaving a single scrape mark! When you opt for a window cleaning Mayfair session, you'll be able to renew the panes of any premises at affordable rates that remain unaltered by minimum contracts or concealed payments. See if you agree with our opinion – have a glimpse at our handy price table below. 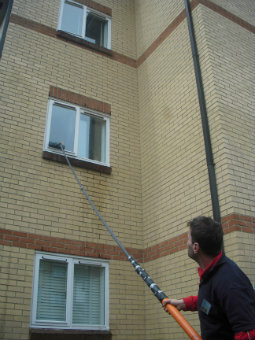 With window cleaning in Mayfair, you can swiftly remove old stains from any commercial or residential property. Keep scrolling to learn how. To rinse your windows' exterior side, the practiced window cleaners in Mayfair will install the latest cleaning gadget – a water-fed pole that runs on purified water. The washing tool's notable reach (22 metres) allows the pros to chase away muddy streaks from any four-storey domain without using ladders or unhealthy cleaning products. To remove stains on high buildings, we've designed a wholly different cleaning approach – the rope access window washing. After estimating your property's dimensions and whereabouts, a team of proven climbers will either use ropes or ladders and squeegees to return the former glory of your casements. We always outline each session beforehand to avoid injuries and can provide you all the necessary COSHH records upon request. To polish windows in-house, the team may have to carry sponges and ladders to reach elevated spots. As our customer base broadened, we widened our window cleaning in Mayfair to cover other London areas as well. Please refer to our concise list to discover which neighbouring locations we work with. For those of you who'd rather book window cleaning services Mayfair W1 online, fill in our get a free instant quote form.